The photos are part of the latest editorial Erwin Olaf made for ELLE magazine. It was shot at the Amstel Hotel in Amsterdam. See, I was kind of right stating that Life Is One Big Balloon Party. 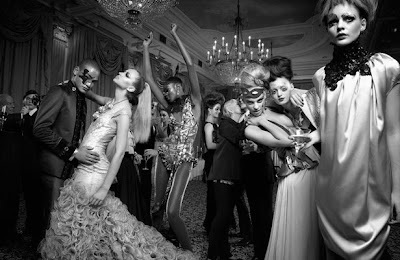 Anyway, Erwin took photos of an extravagant party with glamorous costumed people... The story is entitled “Lof der Zotheid”, or in English “The Praise of Folly” after the most well-known work by Dutch author Erasmus. Really now, what would it be if costumed people would fill the theatres and they will not be actors, but spectators? Would they be better than the actual performers? 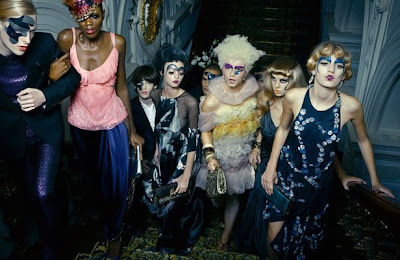 Marie Antoinette's decadent style has been around for a while and it's clearly not going anywhere soon. Not that I would mind, really. I could stare at glamorous rebellions like this for hours without getting tired. And the song for today comes from, tadah, Doris Day. It just went on air today as I was listening to online radio. It is nice when goldies pop up all of the sudden like this. Love this song and the photos are amazing, so many beautiful details I could look for hours and never get bored (as you said yourself)!